Welcome to Spirit Sports Cars. My name is Les Butcher and here is the story about the creation of my sports car the 'Wasp'. 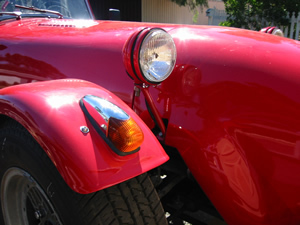 This web site is currently under construction, but hopefully when it is finished it will serve to help other kit car builders complete their projects and I hope I may be able to help you Australian enthusiasts get started. I hope you enjoy my website as much as I enjoy driving my car.